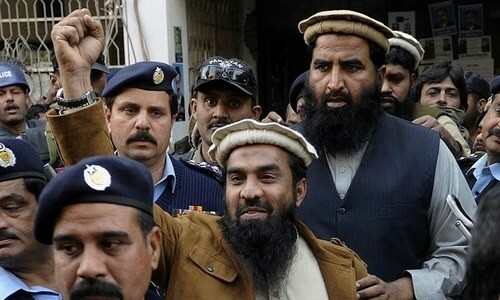 Islamabad, April 9 (IANS) Pakistan's Federal Investigation Agency (FIA) has filed an appeal seeking cancellation of the bail of Lashkar-e-Taiba (LeT) commander Zaki-ur-Rehman Lakhvi, the alleged mastermind of the 2008 Mumbai terror attack. Hearing the appeal on Tuesday, a division bench of the Islamabad High Court (IHC) summoned the record of Mumbai attack case proceedings pending before the anti-terrorism court (ATC) in two weeks, Dawn online reported. Lakhvi was jailed in 2009 for allegedly plotting the Mumbai terror attack in which 166 people, including foreigners, were killed. Ten heavily-armed terrorists, sneaking in through the Arabian Sea, attacked multiple locations in Mumbai in November 2008. Nine of the terrorists were gunned down in the combined security operations while lone survivor Ajmal Kasab was caught and hanged by India. An ATC in Islamabad had on December 18, 2014 granted the post-arrest bail to Lakhvi. In the appeal against the ATC judge's order, the FIA said: "The fact remains that such like cases of defunct terrorist organisations are not so easy to be conducted and especially the prosecution in such cases is the most difficult job in our country for the last many years. "In the present case, the learned trial judge (of ATC) after the terrorist attack in Islamabad courts (of March 2013) refused to visit Adiala Jail for a long time due to security reasons. "Even the prosecutors of this case have been receiving threats through cell phones during the proceedings which were duly conveyed to the concerned authorities. The witnesses are also not secured and reluctant to depose against the accused persons in the given situation." The appeal pointed out that the confessional statement of Kasab was still part of the evidence and it was at no stage discarded and that statement clearly established Lakhvi's link to the Mumbai attack, Dawn said. The bench directed the prosecution to produce the case record and adjourned hearing till a fortnight.